The winter of 2010 – 2011 has felt bitterly long and cold. Now that the warmth of the sun has finally returned to the Northeast United States I am finding myself being lifted from my sluggish winter doldrums. I never realize just how wearisome winter has become until the first signs of the promise of spring. With that comes renewed energy to devote in the studio. I have many ideas, some of which may get me in trouble and are more extravagant than my abilities, but at least some of them should result in worthy pieces of artwork. I am currently working on a scratchboard of two green military macaws; posts on that will be forthcoming. 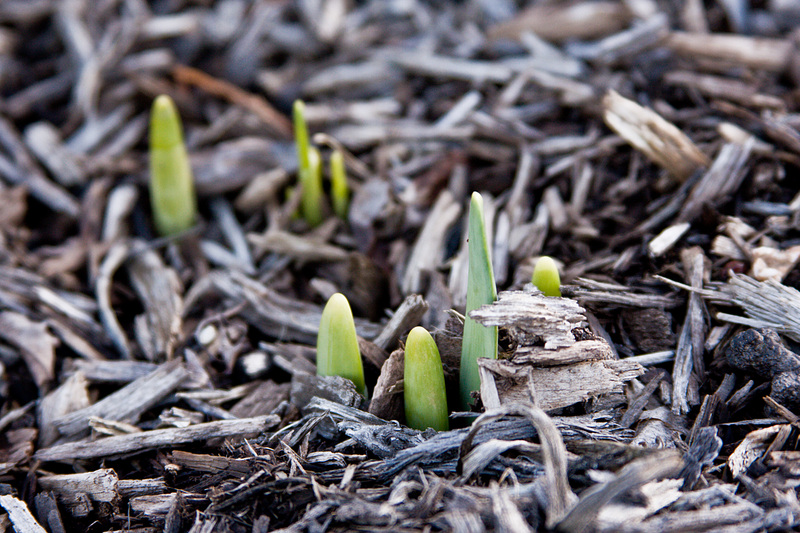 In the meantime, I hope you enjoy this image of my daffodils poking up through the mulch. The picture was taken with my new Canon 40D, a delightful instrument, with which I hope to capture many of the wonders of spring.